We are open to local customers now, for plant and supply pick-up. We have a limited amount of Koi and a few very large Chinese Hi-Fin Banded Sharks. Email me for my address. We ask that you do not show up unannounced! Your one stop for Koi Fish, Pond Plants and pond supplies and lots of information. From what was once a hobby, hence grown into a passion of the heart and then, up until now (and undoubtedly including the future) what can only be called an ‘undying obsession that borders on neurosis’. With that in mind be sure to check back often because, like any true neurosis left untreated, this web site (and my obsession) will only develop, more fully, over time. Scroll down to read more. Koi in our pond. My oldest butterfly koi, Sunny is now 30 years old. My personal pond is where most (but not all) of my breeders live. Within the pages of my website you will find information on pond, aquatic plants for ponds and water gardens. You will find my best pond tips. There is a section for the most needed pond supplies. There are over 30 pages of koi for sale that you can buy and have shipped. 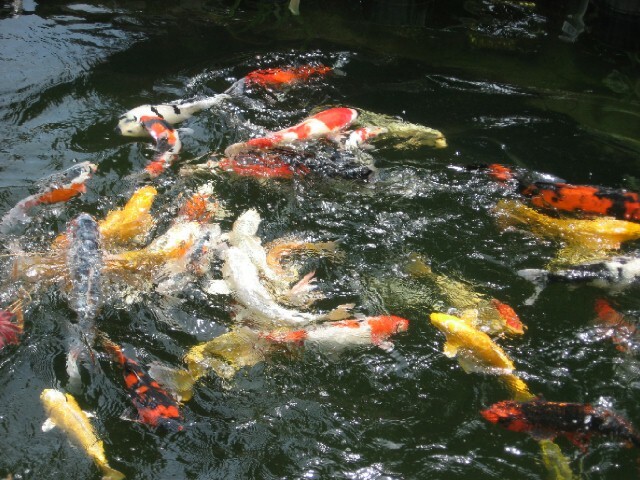 There is a huge section on koi care to keep your koi and pond fish healthy and to help diagnose sick and or dying fish. To find all of this information just click the links under my photo at the top of this page. With over 30 years experience in keeping and selling koi and pond plants we are " koi and pond specialists".